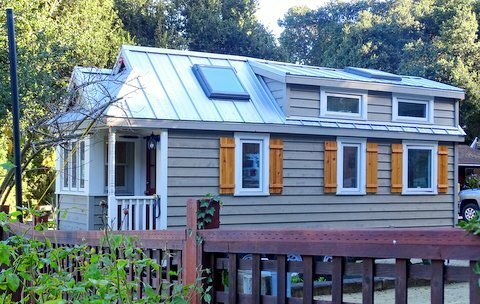 Lizz Flowers's Tiny House. A custom Tumbleweed with two doors! 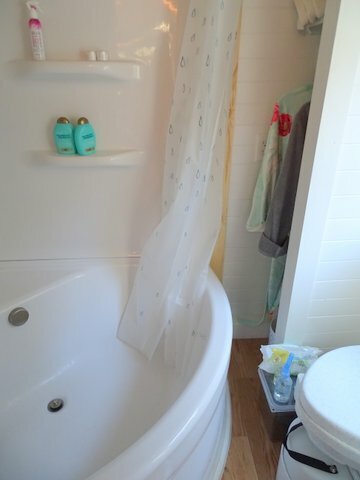 How many of you have been dreaming of going tiny for years? Don’t worry, you’re not alone. Meet Lizz Flowers. 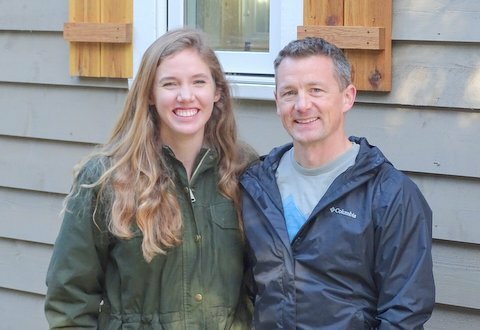 She has been fixated with the tiny house movement since she was 17 years old. 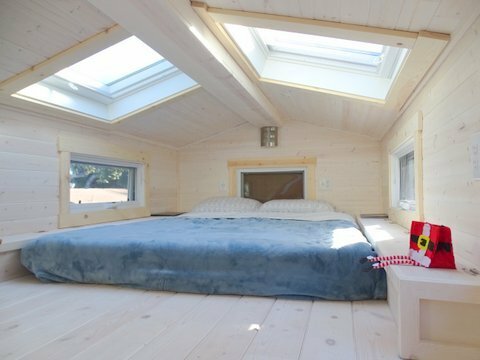 Growing up in New York city, Lizz first came across Tumbleweed Tiny Homes when her mother and sister left a pamphlet on the kitchen table. As she flipped through the pages, she was transfixed by the Tumbleweed Cypress design. Read on to learn more about Lizz Flowers’s Tiny. Years later Lizz’s dream has finally come true. In 2016, she and her partner, Jason, worked with a Tumbleweed design specialist to create a Tumbleweed Cypress that would fit their style and needs. 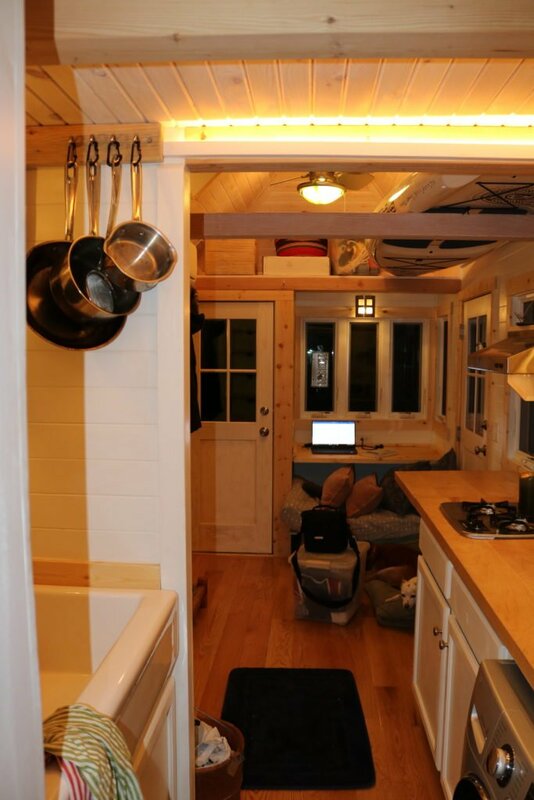 Lizz received updates while her Tiny House RV was in production. Once it was complete, she flew to our Colorado Springs facility to get a first look at her dream come true, eight years in the making! Two doors. The classic Cypress front door (which has a tiny profile) and a standard size side door for fitting appliances in and out. Casement windows downstairs, awning windows in the loft (so they can vent even if it’s raining), and one window by the front door slides up for grabbing the mail. Solid wide plank oak flooring. 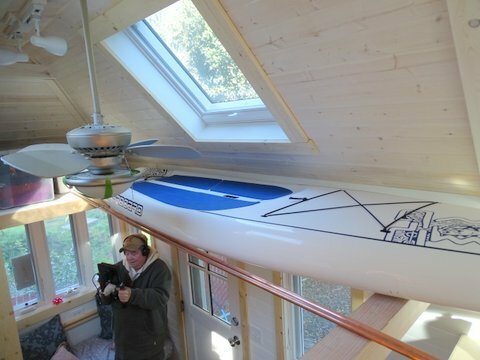 It can be sanded many times in the future and will never have to be replaced. *Tumbleweed has your new tiny house RV currently in inventory. 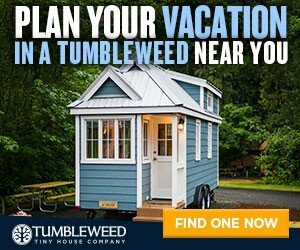 Contact a Tumbleweed Tiny House Consultant to learn more! Lizz Flowers, what would you do differently? I wish I bought a guest book before picking up the Tiny! I wish I had cupboards for clothing on the side of my stairs instead of the drawers. The screen door on the small door gets in the way so I wish I hadn’t bothered with that. Two burners have been fine on the stove, but I wish they were farther apart! With two pots, they barely fit at the same time, and it is a little hazardous. I also wish the burners had their own ignition source. Taxes: I should have registered in Colorado, not in California. If I registered it in Colorado and kept it there for a year, I wouldn’t have had to pay $9k in California sales tax! In the future, Lizz and Jason plan to park their Tiny on a plot of land along the coast, where they would start a small organic farm and café. 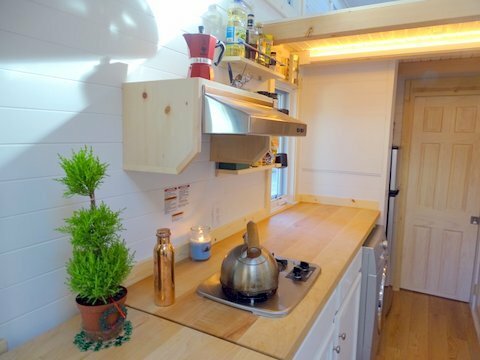 Congrats to Lizz and Jason for achieving their dream of owning a Tiny House RV and, most of all, creating a beautiful space! Design your Tumbleweed and begin achieving your dreams today!